MailChimp is one of the biggest names in email marketing software, right up there with Constant Contact and AWeber. I’ve personally used all three, and they all have their strengths and weaknesses. I’ve put together this review to help you decide if MailChimp is right for your situation. It’s broken into six sections that cover all the main areas of email marketing tools. I’ve based these on the questions that I ask when I’m looking for an email marketing tool. If there’s a section that you’re not interested in, feel free to skip it. 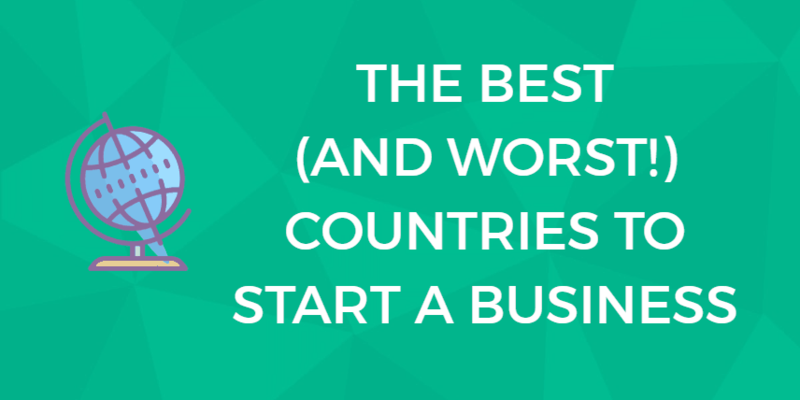 What Do I Get with the Growing Business Plan? How Good is MailChimp’s Deliverability? How Useful Is MailChimp’s Reporting? How Difficult Is It to Add New Subscribers to Your Lists? What Unique Features Make MailChimp Special? What are Some Good Alternatives to MailChimp? What is the purpose of MailChimp? Can I use MailChimp for free? Here is a run-down of some of the leading features included in MailChimp. The MailChimp homepage features an invitation to sign up for free. The first thing you should know is that there is no free trial on MailChimp. But there’s a good reason for that. Unlike virtually all competitors, MailChimp offers a free plan. As in permanently free. The free plan is actually good enough for many small businesses. 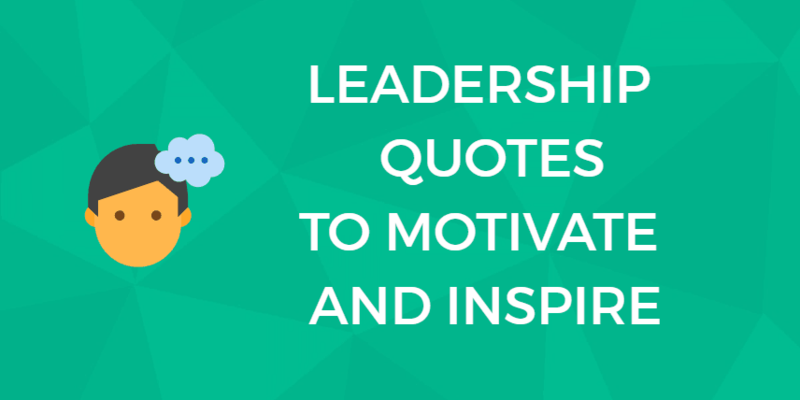 You can add up to 2,000 subscribers, and send up to 12,000 emails per month. If you go over those limits, then you will have to upgrade to a paid plan. 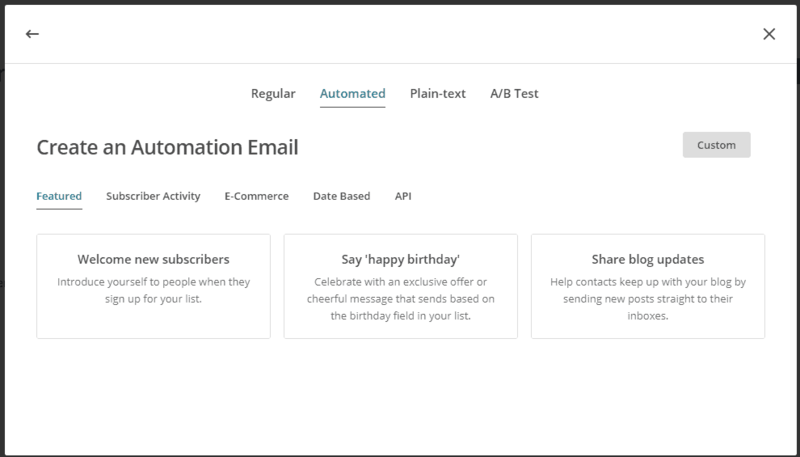 You don’t get all of MailChimp’s features on the free plan, but you get most of them. And if you compare what you get to the lowest tier of other email marketing tools, you get more. For example, automation (being able to set-up autoresponders, mainly) is usually a premium feature on most tools. It’s only available at additional cost. On MailChimp, it’s available on every plan, including the free one. Additionally, the free plan offers A/B testing and reporting. This offer is one of the biggest reasons that MailChimp rose to popularity in the first place. MailChimp has two levels of paid plans. The vast majority of small businesses will be content with the “Growing Business” plan, so I’ll focus on that here. The cost of this plan scales with the size of your list. Every 500 additional subscribers that you have will bump the price a little. This is a much more flexible pricing system than other competitors offer. You can use MailChimp’s pricing calculator to get an idea of how much a paid plan would cost your business. All plans allow you to send unlimited emails. Here are 9 features that may persuade you to upgrade to the MailChimp ‘Growing Business’ paid plan. I’ll go into this later, but the short version is that free plans do not come with email and chat support. Paid plans let you set an email delivery time, and it can be adjusted for each of your subscriber’s timezone. This is essentially advanced split testing, although it works best on large lists. 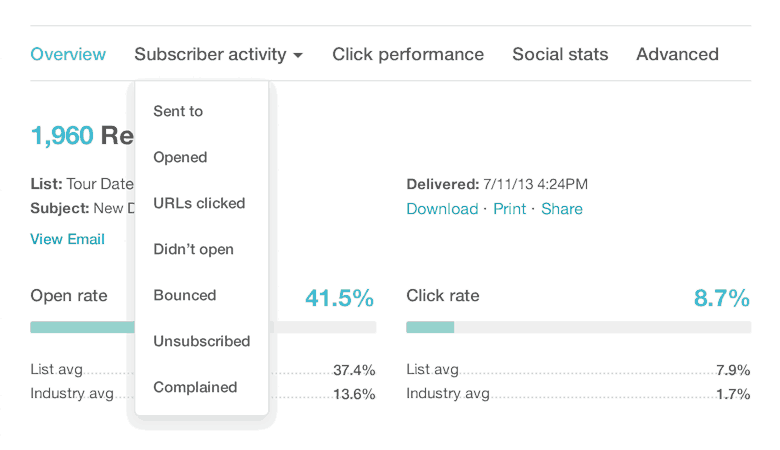 Somehow, MailChimp is able to estimate the gender and ages of your subscribers to allow you to create segments in your lists, which can allow you to create more specific, higher performing emails. Keep in mind that you can always start with a free account and upgrade later. Same goes for a paid plan: you can start low and upgrade as your list grows. Try MailChimp’s FREE plan now. List management is very intuitive in MailChimp. Of your menu options at the top of the screen, everything will be found logically in the “Lists” area. If you have an existing list of subscribers or customers, the first thing you’ll want to do with any email marketing tool is to import them. 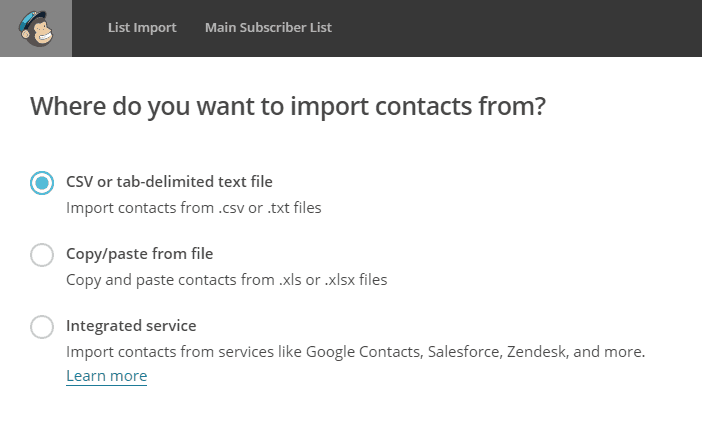 Integrations: If you’re already using a tool like Zendesk or Salesforce, you can automatically import your customers’ details. The import methods work smoothly in almost all cases. I’ve yet to have an issue. And duplicate emails are removed automatically. One big concern is that you don’t want existing subscribers to have to opt-in again to receive your emails. With MailChimp, imported subscribers do not need to opt-in again, which is great. Considering the whole purpose of email marketing tools is to allow you to send emails to subscribers, being able to create quick and attractive emails is important. Emails are handled under “Campaigns” in MailChimp. Regular: This is your standard one-off email blast. You create the email by picking a template and customizing it. Plain-text: Just like a regular email with no images or formatting. Again, a one-off action. 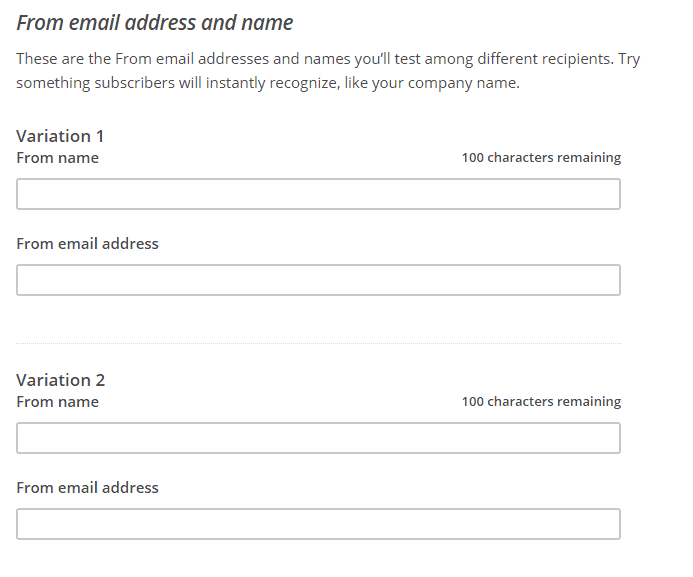 A/B test: Again, this is for creating a single email, but different versions of it. You can split test things like subject lines and email content. Automated: This allows you to create emails that are only sent when specific events happen. You can also create autoresponders here. I’ll walk you through creating each type of campaign quickly, except for “plain-text,” which is nearly identical to a “regular” campaign. All email campaigns start off the same. You choose the list (or segment of a list) that it will be sent to. But then your options are different based on the campaign you choose. In a “regular” campaign, you’ll have to fill in any missing information like the email subject line and who the email should be from, which is the information the recipient sees. 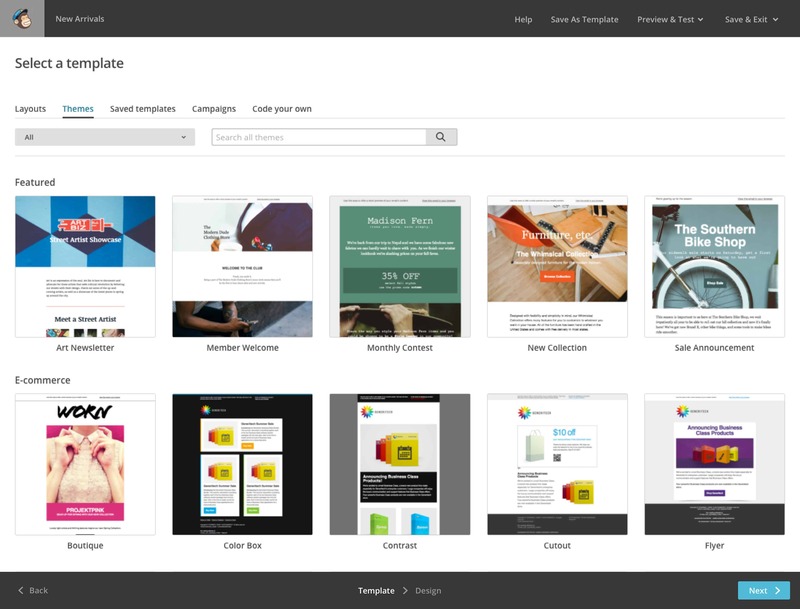 There are more than 50 templates to choose from, and all of them are responsive to a modern design. At no point do you have to start with a blank slate when designing your marketing emails. 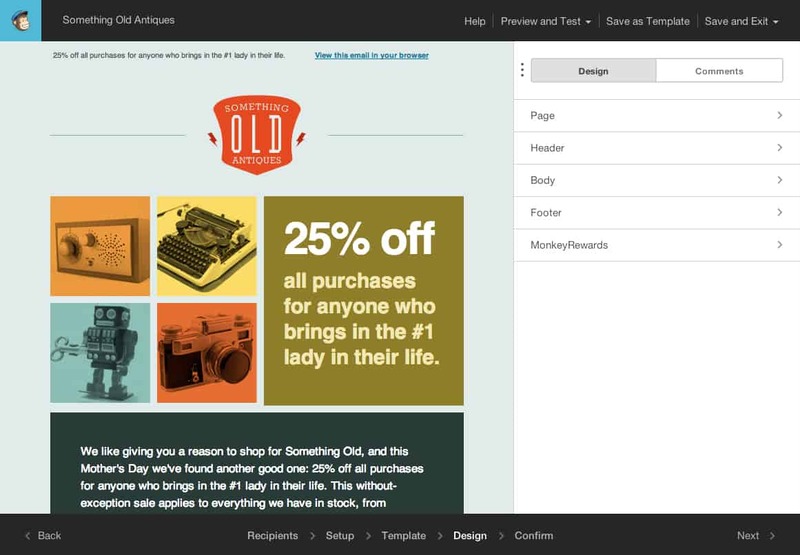 MailChimp offers a number of templates that you can use to build your emails. In addition to letting you pick your template based on its design elements, you can choose one based on the task you are trying to complete (e.g., making an announcement or educating your recipients). Once you have chosen a template, you can edit it as much or as little as you would like. There is a drag-and-drop editor for those who are less comfortable with email design, while those who are more confident can edit the source code itself. Once you pick a template, you then use the visual editor to customize the email to your liking. You view a preview of the email on the left, and when you click an element in it, you’ll be able to edit it on the right panel. It’s all smooth and intuitive — it’s a nice editor. Finally, you choose the sending settings, like when the email should be sent. An A/B test campaign is similar to a regular campaign with one key difference. Right at the start, you’ll be asked to choose which element of the email you’d like to split test. Whichever option you pick, you can test two or three variations of it. You’ll notice that you also get to set a winning combination. Basically, the variations are sent to a portion of your email list. The bigger the email list the better. Then, MailChimp will track each version of the email you created, and determine which one is better, and send the best version to the rest of your list. Other than that, you finish the campaign just like a regular one. The only difference is that you’ll be asked to create two or three versions of whichever aspect of the email you’re testing. This is one area of MailChimp that I strongly believe could be clearer. While it functions well, the process is not always intuitive. There are a variety of automated campaign options to choose from. That being said, the functionality that almost every business looks for is an autoresponder. There is no “autoresponder” option. Instead, you could actually create one through a variety of the options available. I’d suggest using the “welcome new subscribers” series. From there, you can either pick “onboarding series” or “welcome message,” either will work. If you choose onboarding, it will prepopulate a few emails in your autoresponder. If you choose the welcome message option, only a single email template will be generated. The reason I say “it doesn’t matter” is because you can always add (or delete) as many emails as you’d like to the series with a single click of the “add email” button at the bottom. From there, you can start by editing the trigger to choose when it’s sent (the time from the previous email). There are many advanced triggers that allow you to do things like only send an email if the previous one was, or was not, opened. Don’t be confused by “Schedule every day all day.” That just means that the email is always ready to be sent if the trigger condition is met. After you’ve set up your trigger, click “Design email” for each email in your series, and create it just like a regular email (from above). Video above: Learn how this small business uses MailChimp’s automation to engage and delight customers. MailChimp doesn’t actually give a specific deliverability number for a reason that I agree with. They say that it’s because deliverability depends on so many factors, like user behavior (are they spamming? ), subscriber behavior, and more. What’s more important is that MailChimp takes steps to keep deliverability high. It uses hundreds of unique IP addresses, and abuse-detection technology, to keep other users from affecting your email deliverability. Anecdotally, I’ve sent hundreds of thousands of emails through MailChimp, and I’ve never had significant issues with emails not going through correctly. MailChimp has all the basics when it comes to reporting, with a lovely design. Reports include things like open rates, click rates, and even data from others in your industry. Paid plans also come with more advanced reporting, which may be useful for your business. In addition, you can do group searches to find segments of subscribers who all performed a certain action (opened an email, clicked a link, etc.). You could then send targeted emails to these segments. The final reporting feature of note is that you can integrate MailChimp with e-commerce stores (if you have one) to see which emails are generating revenue. This allows you to really learn which emails produce the most revenue for your business, and why. 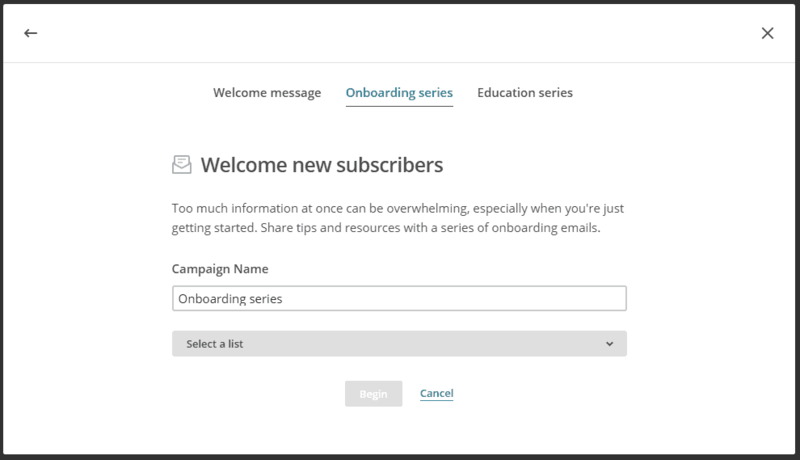 Set up your first email newsletter with MailChimp. You need to be able to add new people to your email lists without too much struggle. The first option you have is using the MailChimp API. I’m impressed with the documentation. There are plenty of clear guides to walk you through it. While there aren’t any language-specific code examples, other people have created libraries for MailChimp in popular languages like Python and Ruby. Alternatively, you can create a signup form to link people to or embed on your website. By default, it’s not very attractive, which may actually be a big deal for you. There is a CSS guide provided for customizing it, but if you’re not too technical, this might be pretty confusing and frustrating. There are a decent amount of features that might make you choose MailChimp over a competitor. First are the advanced segmentation options. 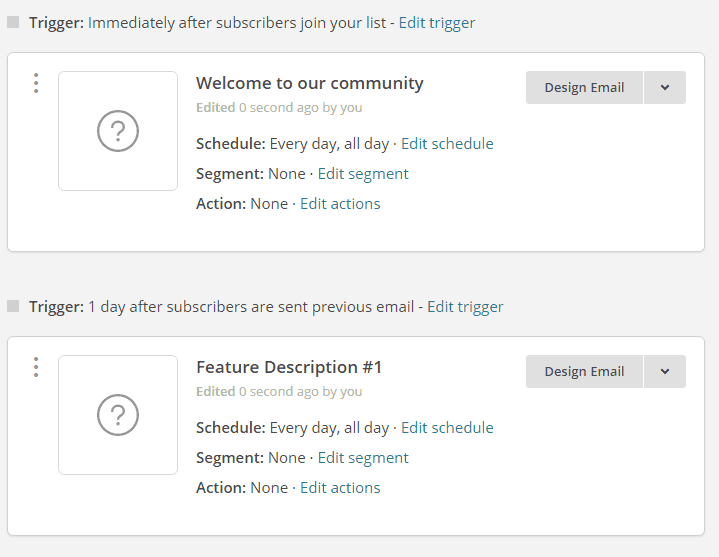 You can create segments of your lists based on whether subscribers performed certain activities. For example, if someone opens an email where you’re offering a product or service, but they don’t buy anything, you can add them to a segment. Then, you could send that segment an email with a coupon or more information to push them towards the sale. This is a big plus. You can not only run Facebook and Instagram ads, you can also run Google retargeting ads from your dashboard. Also you can choose to target people on your lists through those ads or find “lookalike” audiences, with similar characteristics, on social media to expand your reach. Video above: Find out how this small student-run business is using MailChimp ads. 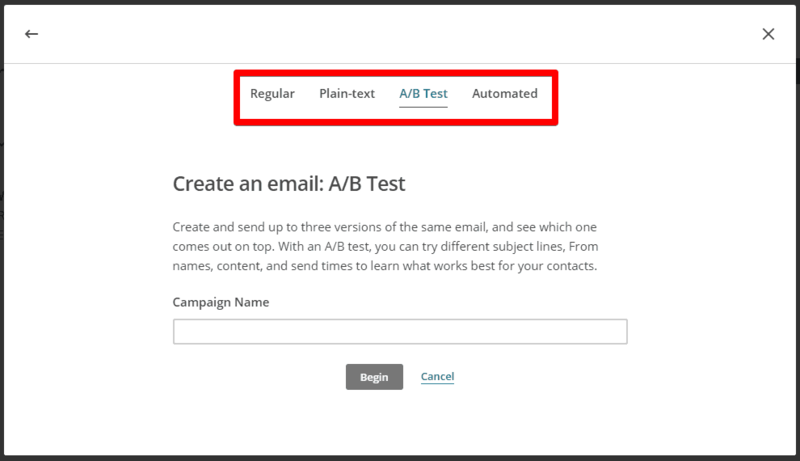 Multivariate testing is just like split testing, but instead of testing one aspect, you can test up to four (subject lines, from names, email content, send times). Just like split testing, you set the condition that lets MailChimp pick the best version. While this is cool, keep in mind that you need a big sample size to get statistically valid results. The more variations, the bigger the sample size you need. Unless you have several thousand subscribers (at a minimum), this won’t be useful. (Those who want to implement the functionality mentioned above but are not comfortable with the complexity of custom code and integrations should look in the Plugins and Integrations Directory for an easier-to-implement solution). The easiest way for you to authenticate is to use HTTP Basic. You can use any string as your username, but you will need your API key, which MailChimp sets as your password. There are a lot of things you can do with the API (much more than we could cover in this article). Rest assured, however, that should you proceed down this path, MailChimp offers lots of well-written articles to guide you in your usage of its API. Not only are all the endpoints well-documented, but MailChimp also provides many code samples you can use to implement your desired feature set. MailChimp integrates with all the big e-commerce tools like Shopify, WooCommerce, PrestaShop, and Magento. This allows you to import customer email addresses, and to tie your emails directly to revenue. Integrating with your Shopify store to gather data you can use when setting up email marketing campaigns (for example, you might want to send out holiday-specific coupons to those who have purchased specific items in the past). Integrating with KISSmetrics so that you can export data about the people who received, opened up, and clicked-through your MailChimp emails. You can create visual displays with your data to better understand how your campaigns are doing. Integrating with Antavo to implement loyalty programs. MailChimp has a feature called Timewarp that I mentioned briefly at the beginning of this review. Instead of sending an email to everyone on your list at the same time, you have the option to send it to each person at that specific time in their timezone. This makes it much easier to maximize your open and click rates. MailChimp ships mobile apps for iOS and Android users so that they can create and send campaigns, manage their subscription lists, track account activity, and so on, from their mobile devices. WordPress users can easily integrate with MailChimp using the MailChimp for WordPress plugin. This makes it easy for you to gather information from the users that visit your WordPress site. As mentioned, free plans don’t come with support. However, the freely available documentation is very good. Additionally, free plans actually come with 30 days of free email support to get you started. Paid plans have 24/7 email support. They respond relatively quickly when you need help. On top of that, Chat is available during the day from Monday to Friday. MailChimp is one of the largest (and one of the most well-known) email marketing platforms around, but that does not mean that it does not have any competitors. It does, and depending on your circumstances, a MailChimp competitor might be a better fit for you and your business. For small-scale users, AWeber is slightly more expensive to use than MailChimp. Both companies offer lots of features commonly-used for email marketing, but AWeber has more themes and templates (as well as a stock image library) that you can use to create your emails. Furthermore, AWeber offers template customization services, but this comes at a cost. MailChimp, however, has better A/B testing functionality. You can conduct such tests via AWeber, but there are more steps you will need to take to set everything up manually. MailChimp and Constant Contact are very similar products, but there is two area where MailChimp is better: A/B testing and automation. 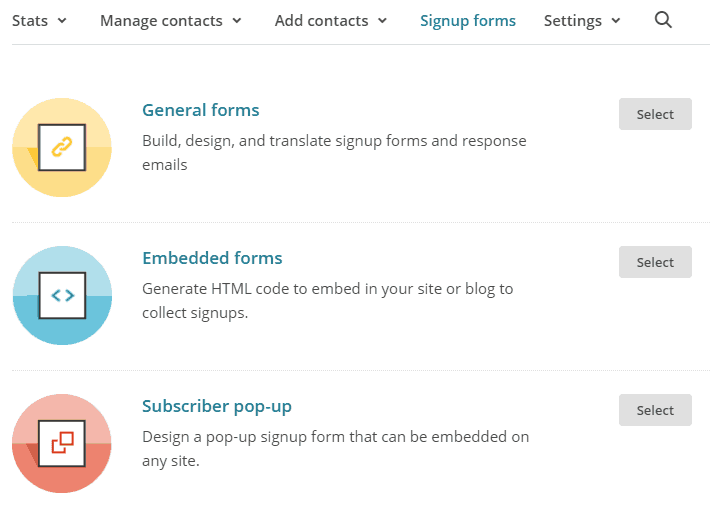 In both cases, MailChimp makes it easy to implement such functionality, while Constant Contact makes it difficult (or, in the case of automation, excludes certain features completely). With that said, Constant Contact has the edge on MailChimp in customer service. MailChimp is not known for its customer service (in fact, some would say it is nonexistent), whereas Constant Contact has more options. For those seeking trials, MailChimp offers a simple forever free plan, while Constant Contact offers sixty-day trials. How easy do you want your software to be? How robust do you want your A/B tests to be? MailChimp provides for slightly easier to use software, though GetResponse makes up for its complexity by being more flexible. Both companies offer robust A/B testing, but GetResponse offers a more feature-rich testing experience. With that said, MailChimp does offer a free plan, which is great for a small business just getting started with email marketing and may not have a robust budget for such tools. However, as you grow your business and your subscriber lists get bigger, GetResponse may be cheaper in the long run. MailChimp is marketing automation software designed to help you reach customers in a quick and effective manner. This allows every store owner to find their audience, engage their customers, and build their brand in order to ensure that they meet customers and targets effectively. 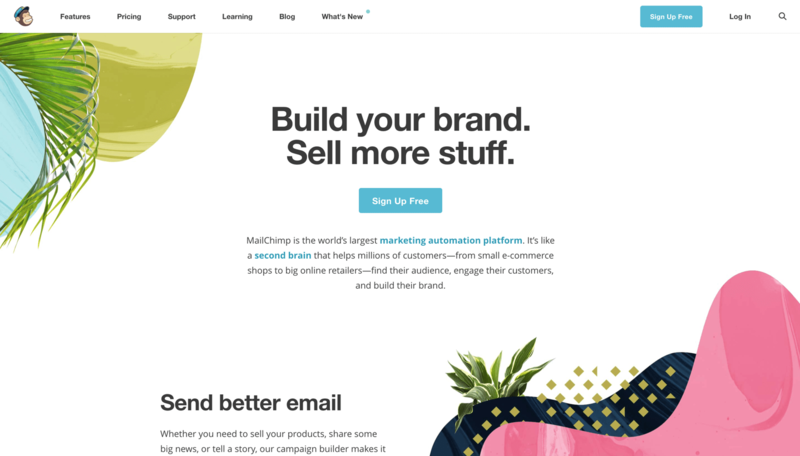 MailChimp includes a free plan which covers the needs of many small businesses. However, those who wish to upgrade to a paid plan or welcome to choose one of the two paid plans available from MailChimp. 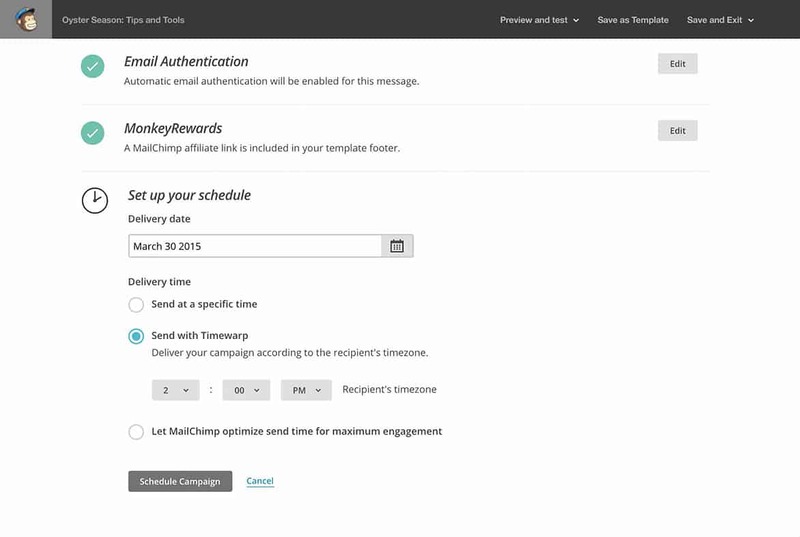 MailChimp is a solid email marketing platform for almost any small business. Creating autoresponders isn’t intuitive the first time. A/B and multivariate testing available. I’d recommend giving MailChimp a try if those strengths above are important to you. Sign up with MailChimp now. It’s FREE forever. You are here: Home > Email Platforms: The Best Ones Ranked and Rated for 2019 > MailChimp Review: Easy Email Marketing. But Will It Make Clients Read Your Mail ? Previous: Drip Review: Best Email Marketing Tool for High-Traffic Sites?